Mark Papa, former CEO of shale producer EOG Resources and currently CEO of small-cap Centennial Resource Development. The price spike continued through last Monday and then collapsed as word spread that Russia and the Saudis were considering phasing out the 1.8 million barrel production freeze that has been in effect for nearly 18 months. From Tuesday on it was all downhill. New York futures collapsed by nearly $5 a barrel going from $72.40 to $67.88. In London the decline started on Thursday but then Brent futures fell by more than $3 a barrel to close at 76.44 Friday. The decline in London took longer as the market was reacting to the news of the US trade war with China. Many analysts are noting the $8.56 spread between US and world prices and that the two oil benchmarks are further apart than they have been since 2015 before US crude could be freely exported. The price spread is a good indicator of how stretched global oil supplies have become even as US oil production has grown to overtake Saudi Arabia and nearing that of Russia. The spread has contributed to soaring US exports, which have hit a record of nearly 2.6 million b/d. How long the recent price drop continues in problematic. The global economy continues to grow at a good pace, and the news from Venezuela, Iran, and Nigeria suggest we may be seeing lower exports from these countries in the next six months. Whatever Russia and the Saudis’ decide to do about their production freeze, it is likely to be lifted gradually to forestall another price plunge such as we saw last week. Some in the US Congress are already concerned about so much US produced oil going abroad that will not be available to mitigate possible supply disruptions in the future. The OPEC Production Cut: Saudi Arabia’s and Russia’s energy ministers said on Friday they are discussing reducing the oil production cut by some 1 million b/d to calm consumer worries about supply adequacy. Saudi Arabia’s Khalid al-Falih added that any such move would be gradual so as not to shock the market. The situation has been complicated by the rapid drop in Venezuelan oil production which now has the cut at 52 percent or 2.7 million b/d more than required by the agreement. The complicated restoration of 1 million b/d would simply bring the cut back to its target level. OPEC and non-OPEC ministers are to meet in Vienna on June 22-23, and the final decision will be taken there. Dividing up the extra barrels among deal participants could be complicated as only a few members of the coalition, namely Russia, Saudi Arabia, and the Gulf Arab states can increase production and gain the added revenue from higher prices. In addition to complaints about the higher oil prices coming from the Trump administration, the Chinese have also complained about the danger of higher oil prices according to a Saudi statement issued by Energy Minister Falih. US Shale Oil Production: The US oil rig count rose by 15 the week before last, the most since February as crude prices climbed to their highest since late 2014. Despite the EIA’s estimate that oil production in the lower 48 states grew by another 24,000 b/d last week, questions about how fast and for how long US shale oil production can continue to abound in the financial press. Last week the rapid growth of the natural gas supplies in the Permian Basin where there is not enough pipeline capacity to move the gas to market became the latest concern. Producers say that unless the federal government allows increased flaring of the natural gas, then the only option is to shut in production until sufficient pipeline capacity can be built. A new problem for Permian oil and gas companies is handling and disposing of water. Earlier this year the University of Texas of the Permian Basin hosted a conference devoted to the region’s energy industry water usage needs. Once a well is producing, the ratio of water to oil can range from 3:1 to 11:1, and the cost of safely disposing of this growing volume of water has become a significant source of rising operating costs. One approach that Permian drillers are using is recycling and reusing produced water for fracking. This can save drillers the companies’ disposal costs and limits constraints on finding new water supplies. A veteran shale oil executive, who was CEO of a large shale oil producer, EOG Resources, said US output growth “disappointed” in 2017 and will probably continue to do so near-term. “If you look at each month of the EIA [US Energy Information Administration] production growth, it’s been essentially flat for nine of the past 13 months,” he said. “We had 500,000 b/d versus early predictions of around 650,000 b/d.” He pointed out that US petroleum inventories so far this year have “built hardly at all” relative to the five-year average, he added: “We’re clearly undersupplied on a US basis.” Moreover, in the Gulf of Mexico, where production has grown by roughly 80,000 b/d annually in the last few years, we could see flat or the start of declining production growth in 2019 and further declines in subsequent years. Exploration investment in the Gulf essentially stalled from 2015 to the present, due to the industry downturn when operators turned their attention to onshore shale that brings quicker payback. Rising interest rates also are becoming a concern for the future of the shale oil industry. Some observers say the near-zero interest rates that the Federal Reserve has mandated in recent years are mainly responsible for the shale oil boom. One analyst says the low rates allowed drillers to borrow close to $1 trillion between 2006 and 2014 which has resulted in multi-billion dollar losses by the shale oil industry. Some are warning that higher interest rates could bankrupt more shale oil drillers, darkening the prospects for higher production levels ahead. An updated analysis of the outlook for US shale oil production using EIA output data and average well production data concludes that production will peak and start to decline about 2023 which is in line with what other analysts have been saying. The great US shale oil boom has five years or less to go. Iran: Supreme Leader Ayatollah Ali Khamenei on Wednesday sneered at the US demands that his country curb its military ambitions and issued his own set of demands to Europe to remain in the nuclear deal. As could be expected, Tehran is threatening to pull out of the nuclear agreement unless Europe comes up with an “economic package” that will compensate for any economic harm done to Iran from the new US sanctions. The Iranian official who made the threat noted that hardline forces in Tehran were getting stronger and that the country would have to pull out of the non-proliferation treaty and revisit its nuclear doctrine. Iran’s market share in Europe has already begun to slip as European refiners have started buying alternatives to Iranian crude well before new US sanctions begin later this year. Europe has been buying just under a third of Iran’s oil exports of around 2.4 million b/d. France is examining the question of whether the European Union could compensate European companies that might be facing sanctions by the US for doing business with Iran. EU rules going back to 1996 could allow the EU to intervene in this manner to protect European companies against any US sanctions. Despite the rhetoric, however, Iran expects some disruption in its oil industry after the reintroduction of US sanctions that would make it hard to stick to its current production goals. Iranian state news agency Shana quoted Zanganeh as saying achieving its stated daily production target of 4.2 million barrels of crude would be “difficult and although it might take more time, we will not do away with it.” Tehran is relying on its two biggest buyers, China and India, to boost its production despite the sanctions. Iraq: While waiting for a new government to be formed, a process which could take weeks or even months, little new is happening in Baghdad’s oil industry. Rosneft has discovered a new oil field in southwestern Iraq, the company said. The Russian oil firm acquired the rights to the Salman field when it bought smaller Russian oil producer Bashneft two years ago. Until recently, Rosneft was widely seen as a partner of the Kurdistan Regional Government, which is still fighting Baghdad over its share of the oil revenue. Saudi Arabia: Most of the news concerns the Kingdom’s discussions with the Russians over modifications to the OPEC oil production freeze. Energy Minister Khalid al-Falih confirmed on Friday that the initial public offering of a 5 percent share in Aramco had been delayed until 2019. Libya: Agoco, a unit of the Libyan National Oil Corporation, has had to significantly reduce oil production at its fields because the hot weather has caused several turbines to stop working. The decline in production amounted to some 120,000 b/d. This is one of the first signs that high ambient temperatures could someday affect the Middle East and North African oil production. US Treasury Secretary Mnuchin said there is a “massive opportunity” for US energy exports to China after the US and Beijing reached a hiatus in their threats of a trade war. China has become one of the biggest buyers of US oil since the government lifted an export ban in 2015. Last week Beijing announced that it would take in more natural gas from the US to satisfy growing demand as it tries to reduce the use of coal. 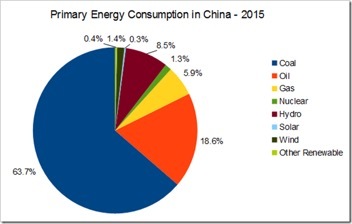 Oil, LNG, and foods are the key products that the US has in surplus and the Chinese need. Increases in sales of these products could help mitigate the US deficit in the US-China trade balance. If US crude exports continue to grow, there will be an increasing number of very large crude carriers loaded for China in coming months. The US Energy Information Administration projects the US will average 11.9 million b/d of crude production next year, surpassing Russia as the world’s biggest producer. The light, sweet crude that comes from shale is ideal for many Chinese refineries who are desperate to import more crude as domestic production declines. Last week PetroChina, Beijing’s top gas producer, curbed supplies of natural gas to some industrial users in its northern and western regions. This is the first sign of tight supplies only two months after China experienced one of its worst winter gas crunches. To prevent another round of winter shortages, PetroChina has already started limiting gas supplies and hiking prices for major customers, including city gas distributors and inland gas liquefaction plants. The European Union settled its multiyear antitrust case against Gazprom last week, suggesting that cheaper and freer natural-gas flows from Russia are coming. Gazprom pledged to set gas prices in line with open Western European markets. President Trump has been pressuring the EU to buy more US energy and cut its dependence on Moscow. The political row over Europe’s dependence on Russian natural gas is not hindering preparatory work for the subsea Nord Stream 2 gas pipeline from Russia to Germany, with dredging work starting off the Baltic coast last week. A senior US State Department official threatened sanctions for the controversial project. Washington sees the second Nordstream pipeline as a security threat because it could give Russia the chance to install “undersea surveillance equipment” in the Baltic. Gazprom said on Saturday it has signed an agreement with the Turkish government on a planned gas pipeline across Turkey and agreed to end to a dispute over the terms of gas supplies. Turkish President Erdogan said earlier on Saturday that Turkey and Russia had reached a retroactive agreement for a 10.25 percent discount on the natural gas Ankara buys from Gazprom. Turkey had delayed issuing a permit for the Russian company to start building the land-based parts of the pipeline which would allow Moscow to reduce its reliance on Ukraine as a transit route for its gas supplies to Europe. The recent closure of the Trans- Forcados Pipeline following the May 7th explosion may affect the ability of the federal government to fund its 2018 budget. Salvic Petroleum Resources Limited is undertaking the emergency repairs and is said to be working round the clock to bring the pipeline back up in a matter of days. However, FBNQuest Capital has predicted that Nigeria’s the crude production target of 2.3 million b/d proposed in the 2018 budget will not be achieved because of the sabotage that is taking place in the lead-up to the 2019 elections. FBNQuest sees average output this year at 2.07 million b/d, compared with 1.90 million in 2017 and the forecast of 2.30 million in the 2018 budget proposals. Oil production will be helped soon with the opening of Total’s deep offshore Egina oilfield which is due to start production in Q4 at 200,000 b/d. The Minister of State for Petroleum Resources indicated last week that but for the timely interventions of the government with militants who resumed bombing of oil facilities in the Niger Delta three years ago, the country could have been crippled. Nigerian oil and gas company Oranto Petroleum will be cooperating with Russia’s Rosneft to develop 21 oil properties across Africa. Rosneft does not have a significant presence in Africa except for a 30-percent stake in the giant Zohr gas field off Egypt in the Mediterranean, as well as some prospects in Mozambique. Oranto Petroleum and its sister company Atlas Petroleum International are Nigeria’s largest privately-held exploration and production firms. The companies together have 22 oil and gas licenses in 11 jurisdictions in Africa, including in producing assets in Nigeria and Equatorial Guinea. During his inauguration speech, Maduro said he would seek the help of OPEC to double Venezuela’s oil production, which is currently at 70-year lows. Maduro also said the current production rate—about 1.5 million b/d—would need to increase by 1 million by the end of this year. While asserting that Venezuela would defeat the US sanctions and reverse its economy, he admitted that it would be a tough job because of the sanctions and the ruinous state of its oil industry. The US imposed new economic sanctions after Sunday’s election and 14 countries including Argentina, Brazil, and Canada have recalled their ambassadors from Caracas in protest. In retaliation, Maduro ordered the expulsion of the US chief of mission in Venezuela as the US ambassador was tossed out long ago. The critical issue remains as to whether Washington will push Venezuela to total collapse. This could happen if the US bans imports of Venezuelan oil cutting off an important source of hard currency or forbids the sale of diluents to Caracas which are vital to preparing heavy oil for export. Battery booster: BP Ventures has provided $20 million in funding to an Israeli startup that makes ultrafast-charging batteries, which aims to make it possible for electric cars to charge in just five minutes—in a time comparable to filling a tank with gas, the supermajor said today. Southwest drought: The worst drought to hit the Southwest in decades continues to grow even worse, and many are already comparing this current crisis to the Dust Bowl days of the 1930s. 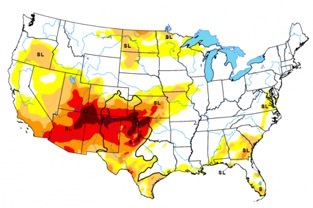 The epicenter of this drought is where the states of Utah, Colorado, Arizona, and New Mexico all come together, but it is also devastating areas of North Texas, Oklahoma and Kansas as well. Portions of seven states are already at the highest level of drought on the scale that scientists use, and summer doesn’t officially arrive for another three weeks.